We’ve visited Soju Girl a number of times since opening (and especially just after opening) and have continued to be impressed by the fresh flavours that pervade its food and drink. Still, with such experience behind the bar as can be found at Soju, there is only one way to test its mettle. Perched on a pair of stools and with an appetite for gin and olives, we asked the bartender (Nick) if he made a decent martini. “Martini?” he replied, “I make a great martini.” In that case, good Sir, we are in your hands. With our usual loose directive of ‘make a martini that shows off your venue’ we were informed that Nick didn’t actually drink martinis. This caused a look of concern to cross our faces, wondering how it was possible to find the necessary balance required to execute the drink correctly. “Millers?” Nick had taken our directive and begun to form the drink in his mind, hoping it will match what we have in ours. We nodded in agreement, knowing the path from here will determine the result. The bottle, at room temperature, made it way off the bar to land next to a glass quickly cooling with a scoopful of ice. The second ingredient arrived, this time extracted from the fridge. It’s Noilly Pratt, and we nodded again as we see the way this is going. Certainly there was nothing groundbreaking in the way Nick was putting together his drink, but given he doesn’t drink martinis, this certainly seems to be the safest method to use. The ice was removed from the martini glass and it was time to pour. Slowly, gently, but ending with the first flourish we’ve seen since the bottle of Millers appeared, all that was left to do was add the olives. Nick opened a plastic container he grabbed when retrieving the Noilly. “Sicilian olives. We use only these for our martinis” His voice had a sense of triumphalism about it, as though he is announcing an Oscar winner. We couldn’t help but get caught up with the excitement. If we’d wanted a martini when we turned up, we certainly did now. Three olives on a toothpick were delicately placed in the glass. Nick presented the martinis to us, leaving the bottles on the bar momentarily should we be unfamiliar enough want to garner further information. We didn’t. We just want to drink the martini. Immediately. Trying desperately to resist a moment longer, it was time to take in the visual aspects of the drink. Looking at the body of the martini, there was no trace of ice whatsoever – a testimony to Nick’s stirring technique. On top of the glass sat a pool of olive oil, approximately the size of a twenty cent piece. This pleased us on the early sips as it allowed just a hint of olive to meet the palate, prior to the olives properly infusing through the gin. The Sicilian olives appear to be the signature ingredient, increasingly adding balance to the strong juniper notes of the Millers gin. 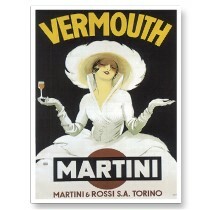 By the time we neared the end our mouths felt warm and the martini had taken on that wonderful feeling of viscosity. For someone who doesn’t drink martinis, Nick has made a very satisfying if somewhat unadventurous classic. It seems this martini is of similar quality to the rest of the drinks featured on Soju Girl’s cocktail list. The only downside we could find is the price. 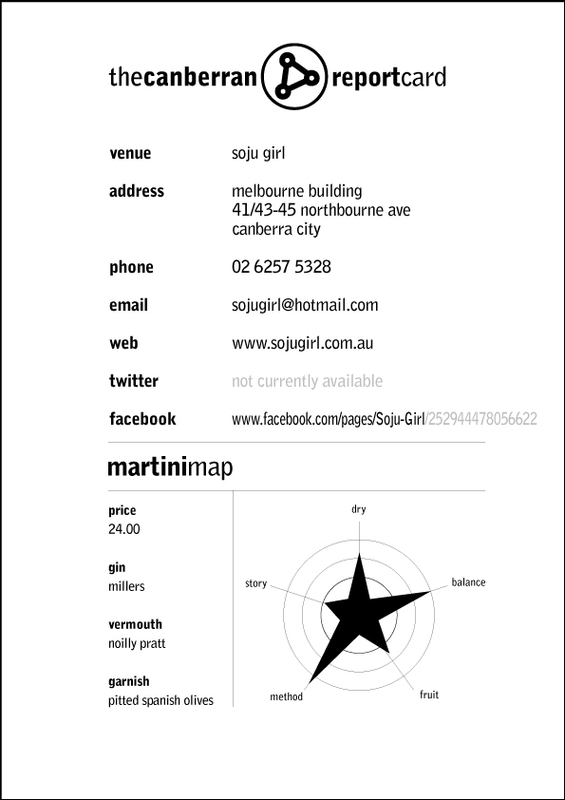 $24 for an after-work martini is a stretch at even the very best of venues in the very best of cities. It may be worthwhile for management to have a look at the bar-versus-dining room price points if they are truly chasing a relaxed drinking crowd. *Editors note. Yes, the Martini map below lists Spanish rather than Sicilian olives. We’ll amend ASAP. Should’a asked you if you wanted a twist. Also “Bruising Gin” is a load of cobblers. Cobblers? Perhaps. But would you prefer subtle, gentle, considered treatment or a quick shake and pour? We’re all for precision, process and patience. A good martini is three ingredients with a large dash of theatre.